Bram Stoker’s Dracula was one of those early 90’s supermovies that earned a lot of hype for both its cast and its source. A blockbuster Oscar-potential flick directed by Francis Ford Coppola was expected to do well. The game based on the film was obviously on the way. 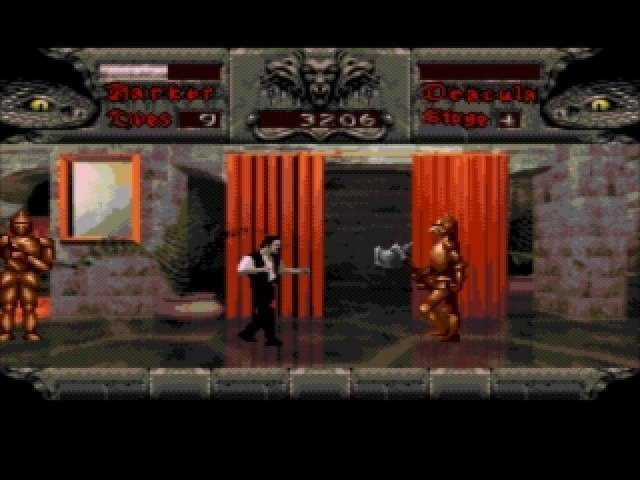 You play as Jonathan Harker, loosely following the movie’s plot and heading out to slay Dracula. It’s been a while since I’ve seen the film, but I seem to remember Keanu Reeves’ Harker spending two-thirds of the movie trapped by Dracula in the chamber of perpetual indulgence. I do not recall him being a martial arts grandmaster, and I do not recall him killing Dracula with his bare hands. 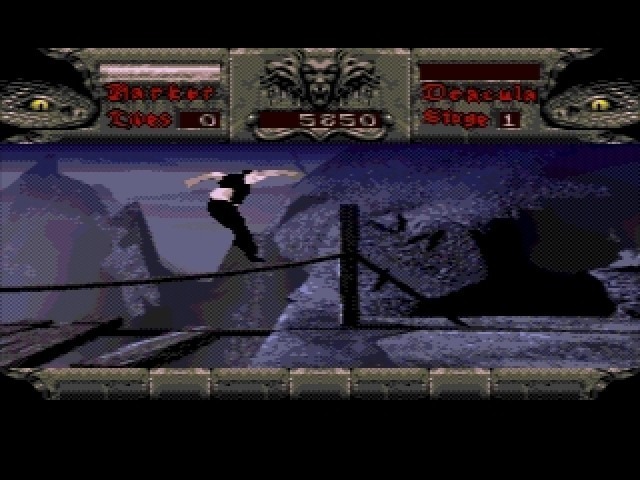 The game’s Harker is not quite a total badass, but he knows some moves, and he does have the ability to slay Dracula simply by repeatedly karate kicking him in the head. I’d rather have Simon Belmont on my side, but Harker will do in a pinch. 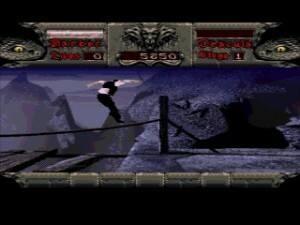 Dracula was simultaneously released to the 16-bit consoles as a standard cartoon-looking platformer. The Sega CD adopts a totally different approach. It’s still a platformer at heart, but along one level plane broken up by rooms. Video backdrops make up the backgrounds, which are CG renders of castles, cemeteries, London streets, and the like. The backgrounds scroll smoothly in relation to the movement of your character. Even though it’s not true 3D (just pre-rendered video), it still works convincingly and is a more realistic look than hand animation. The character and the enemies are a mix of still bitmaps of actor/models and hand-drawn creatures, but all manage to look like they are inside the rooms instead of simply overlaid upon the background. The only real fault of this setup is that it requires Harker to move at a plodding pace. The video can only scroll at one fixed, cautious rate. Your character speed is limited to match. More than anything it requires you, frustratingly, to fight every enemy you encounter because you won’t be able to run, dodge, or escape. It also makes for levels that seem to drag on and on as Harker cautiously ninja-creeps across every floor. Level do get a nice variety of fresh looks to them, which is somewhat surprising considering the material. How many different ways can you make a castle look? Here, the answer is to break up the repeating themes and place the doubles under new circumstances – the castle at night for one level and the castle at sunset for another. Even the rooms look fairly unique by assigning each one a purpose and some occasionally different gameplay, like the kitchen room where haunted pans and knives fly toward the screen. It’s the gameplay that suffers from the least creativity, as you endlessly fight monster after reused monster. There are seven levels, and you’ll kick at rats in every last one of them. Bats, zombies, ghosts, living suits of armor, and other headliners from the horror troupe will also appear, each dispatched with varying numbers of punches and/or kicks. There are no weapons or learned abilities, and no ranged attacks to keep you from the beasties. No powerups laying around either, only hidden extra lives or health chalices for defeating groups of enemies. If I was going to slay Dracula, and I knew I was going to slay Dracula, I would have at least brought a cross. Or a bazooka. Or a cross bazooka. Forced platform jumps while the screen keeps scrolling are easily the worst part of the game. As expected, the game takes sweeping liberties with the story. A narrator introduces each level as he sits by the fireside and appears to read the novel, but the differences are instantly clear with lines like “And so Jonathan Harker sets off to lay Lucy to rest… as well as the hordes of mental patients escaped from the asylum who are now in league with Dracula!” Edited clips from the film also show up to introduce bosses, but they’re an absurdly schizophrenic collection of images. Sometimes they’ll make a little sense, like a film clip of Dracula in beast form before you fight him as a werewolf. Other times they’ll be three second montages of whatever was left on the cutting room floor. “We don’t have any footage of the player fighting Young Dracula in the cellar, so here, this shot of Gary Oldman petting a dog will do.” I’m completely serious. You don’t have much in the way of moves, but they’re enough to get the job done. B punches, C kicks, A jumps. Enemies generally come at you from the top, middle, or bottom of the screen. You have, essentially, one attack for flying enemies, two attacks for mid-range enemies, and one for low attackers like rats and spiders. As I said, not terribly interesting, but the job gets done. The only real trouble with fighting comes with the kicks; pressing C alone attack low, pressing C + Forward gives a strong higher kick. You’re obviously not going to be booting rats with this move, but Forward includes turning. So you KO an enemy coming from behind, turn to field kick a charging rat, and kick high above it. If you know this is going to happen you can somewhat prepare for it, but it will still trick you in a fast fight. Jumping is also frequently tricky and sometimes unfair, but jumping challenges become rare past the first part of the game. There’s an original gothic-style soundtrack for the score, and it sounds appropriately haunting. Effects do sound beefy, and Harker’s forward kick especially sounds like it’s sending a lot of power into the chest of the undead. Cutscenes from the film have no sound, so characters will move their mouths without speaking. A little strange, but the score continues nicely underneath and doesn’t seem too jarring. The fireside narrator does a fine job as well, with a booming, jaunty voice like John Rhys-Davies. He’s enjoyable to listen to, and what more could you ask for than that? I briefly played the SNES version of the game for comparison, and I have to say that, despite its faults, I like this version of Dracula much better. The CG backgrounds interplay well enough to avoid being a gimmick, the challenge is high without being impossible, and it’s a pretty sharp-looking title. The rendered backgrounds come at a price though, as this is an unusually limiting platformer. If you’re expecting to leap up and around at a respectable pace, you’ll be disappointed. If you can handle creeping ahead slowly and perfecting your timing to defeat pattern-based attackers, there are certainly worse ways to spend seven levels. Does the CG “realistic” look pretty successfully. Much better than the other console versions. Only a few moves, slow gameplay speed overall. This one looks nice, but I wouldn’t want to play all platformers like this.